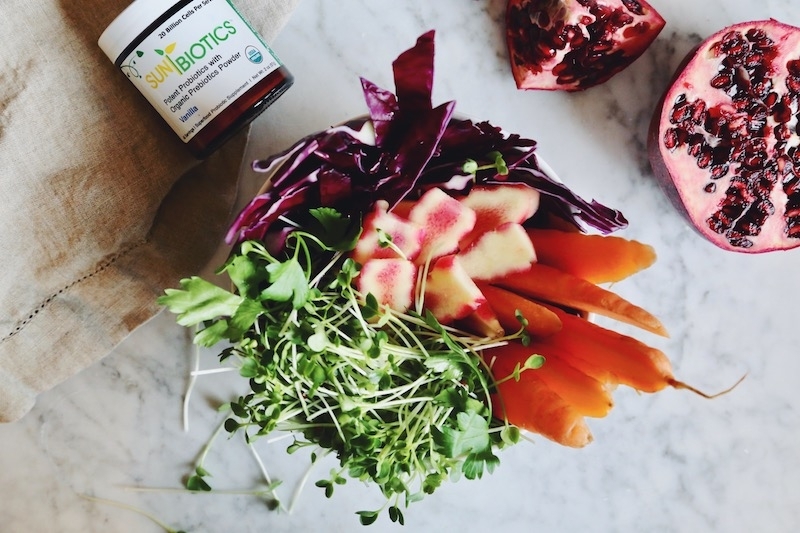 Blog - Prebiotics Vs. Probiotics : What is the Difference and Do We Really Need Them Both? Gut health is a very hot topic right now in the wellness scene. If you follow any health related blogs or social media platforms you've most likely read a thing or two about the importance of looking after the health of your gut. And rightly so, not only does the gut act like a second brain (yep! More on that later..), it also hosts what's known as the body's microbiome - trillions of beneficial bacteria that we simply can't live without. Literally. Probiotics are bacteria that have an incredibly dynamic and symbiotic relationship with the human body. In the past, the term bacteria was pretty much always used in a negative light. Bacteria = something that causes infection and can make us sick. But not all bacteria is harmful. Bacteria such as lactobacillus acidophilus and bifidobacterium bifidum are known as probiotics (meaning “for life”) and actually help keep us well. These are the good guys that live within our digestive system (and elsewhere such as the surface of our skin) that help us digest and assimilate our food, synthesize key nutrients like B Vitamins, and act as our immune system's first line of defense against pathogenic attack. They help maintain the microbial balance by keeping pathogenic yeasts, funguses, bacteria and viruses in check so they don't overpopulate and wreack havoc on our health. Not only do probiotics boost our immunity and help with digestion, they also boost our mood and overall brain health. Many don't realize that the intestines are actually a second brain in the body, containing some 100 million neurons in what's known as the enteric nervous system. These neurons are in constant communication with our central nervous system – sending and receiving signals from the brain. It turns out, the bacteria in our gut have a direct impact on the chemicals being produced within our brain. It's surprising to learn that it's actually the bowels, not the brain, that hosts 95% of the body's serotonin - one of our most important feel-good neurotransmitters. In short, prebiotics are special plant fibers that aren't broken down or absorbed in our intestines, instead they serve as a source of nourishment for our probiotic bacteria, helping them build in number and flourish. Inulin and fructooligosaccharides (FOS for short) are two examples of prebiotic fibers. Prebiotics are an absolutely critical component of overall gut health, and can help improve the efficacy of probiotic formulas. Prebiotics are found in a handful of select raw plant foods. Keep in mind that cooking can damage the prebiotic fibers of these foods - so be sure to eat plenty in their raw state. Both prebiotics and probiotics are an invaluable part of a healthy diet, and a healthy gut. 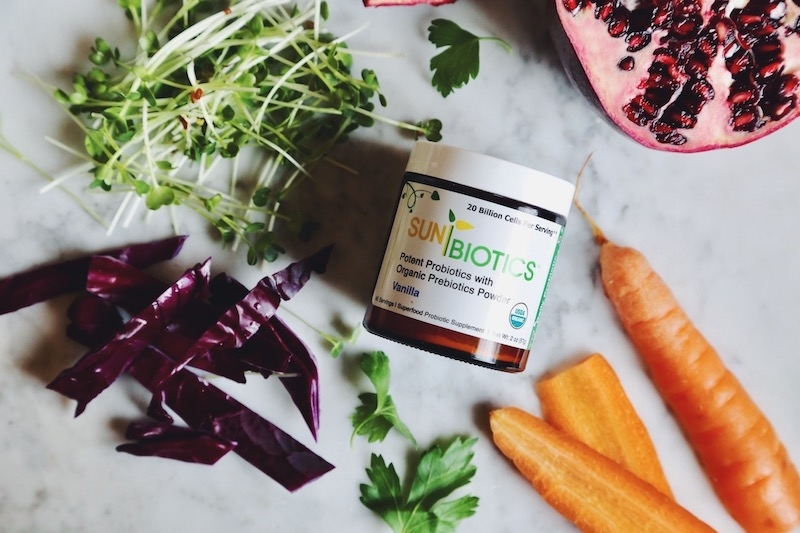 Visit our shop to learn about Sunbiotics probiotic supplements which also contain prebiotics from organic Jerusalem artichoke and yacon root. These food-based supplements come in formulas for both adults and children, are certified organic, and are free of common supplement additives.